Arthritis in the elbow is not as common as in other joints, but it can be painful and sometimes impact function. Elbow arthritis is treated by Dr. Peter G. Fitzgibbons, MD at The Centers for Advanced Orthopaedics: Maryland Orthopedic Specialists Division, who performed fellowship-training in hand, wrist, and elbow surgery through the Harvard Hand & Upper Extremity Fellowship based at Brigham & Women’s Hospital in Boston. 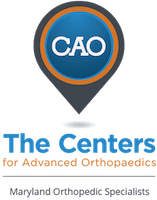 With office locations in both Germantown and Bethesda, Maryland, he and a team of orthopaedists, hand therapists, and physical therapists offer a comprehensive range of services covering the diagnosis and treatment of arthritis in the elbow. Arthritis is pain and swelling in a joint, usually caused by loss of the cartilage that lines the joint. often be treated with medications. How do people get arthritis in the elbow? Elbow arthritis often has no clear cause. When there is no clear cause, it is likely an inherited problem. Other times it is post-traumatic (caused by an old injury), or inflammatory (i.e. rheumatoid arthritis). on the use of the elbow. What is surgery for elbow arthritis like? involve a short hospital stay, and is done with general anesthesia (i.e. patients are completely asleep).